I love to try new things in the kitchen. Fortunately my family and friends are usually willing guinea pigs! So what you'll find here is just what it says... "Just what's going on in my kitchen"... and sometimes my garden! Are you seeing this in a reader? So I've been trying to eat healthier lately and as a result have been checking out some veggies I hadn't really tried before. 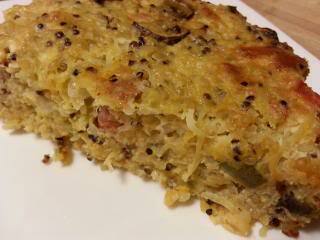 Spaghetti Squash... sounded interesting... Tawny said it was good... why not? So I picked one up. But what the heck am I supposed to do with it? I started browsing recipes and found one on Artsy-Foodie. Spaghetti Squash PLUS quinoa?! Wow! This totally fills the bill! So that was the base for this recipe. As you can tell, I haven't really been blogging lately, so I didn't take the step by step pics I usually have. But this recipe is just way too good not to share! Pour a drizzle of olive oil into a medium skillet and cook peppers, onions, garlic and mushrooms until tender. In a large bowl mix cooked veggies with all remaining ingredients. Pour into a greased lasagna pan. Bake 1 hour 15 minutes or until it's set and golden. This smelled amazing while it was cooking. I really didn't know what to expect for the flavor. I figured it would be kinda frittata-like... and it was. But it was also hearty and light all at the same time. The mushrooms were savory. It had a bit of mild spice to it from the pepper jack and the Rotel. It was moist and creamy and satisfying. Add a nice crisp salad and this is a perfect meal. And crazy healthy! When I was looking for cottage cheese, I found some by Fiber One. More fiber? Yes please! This makes 8 hearty servings. This would also make 16 or more delicious appetizer servings. Wicked Good! Wicked Healthy! It was so good, that I sat down to post this right after dinner! Why don't I eat like this more often?? Holy crap this is wicked good!!!! I don't have step by step pics, because I was wicked busy and distracted, but this is too good not to share! I found this in the Better Homes & Gardens Mexican magazine... ya know... those cooking magazines at the checkstand at the grocery store? One of those! I'm SO glad I picked it up!! Cut each ear of corn in half. Place corn pieces in a large pot and cover with water. Let soak for 10 minutes. In a small bowl stir together cilantro, ground ancho chile pepper, lime peel, and cayenne pepper; set aside. This stuff smells amazing!!!! In an extra-large bowl whisk together melted butter, mayo, sour cream (or crema), and lime juice and set aside. Drain corn. Brush corn with butter mixture and place on a grill directly over medium-high heat. Cover and grill for 15 to 20 minutes or until corn is tender, turning every 5 minutes and brushing with butter mixture several times during the last 5 minutes of grilling. 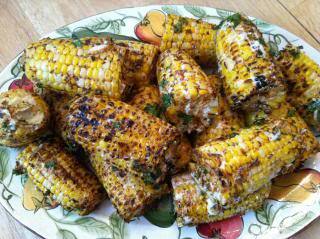 Place grilled corn in the remaining butter mixture in the bowl and toss to coat. Sprinkle cilantro mixture over corn and toss to coat. Season to taste with salt. I had a piece as soon as I took them off the grill because they smelled so good... then I had another! They were great! The sweet corn with the tangy sour cream & lime juice, the savory chile powder, the spicy cayenne, more tangy lime, herby cilanto... so so so yummy!!!! My husband HATES cilantro... but he LOVES this corn!! Then I let everyone else know they were ready! There's no real recipe for this. It was an impromptu kinda thing that turned out amazing! Heat enchilada sauce in a small skillet. Dip toasted side of the bottom part of the bun into the enchilada sauce. Please sauce side up on a plate. Spread a spoonful of refried beans over enchilada sauced bun. Drizzle or dollop on some chipotle sour cream. Spread guacamole on toasted side of the top part of the bun and cover sandwich. I threw a pork loin roast into the crockpot with some fajita seasoning my mom got me in New Mexico and some chicken stock. I put it on high and cooked it all day. If my brain had been just a bit faster than my body, I would have used beer instead of chicken stock. Oh well... it was still wicked tasty. I had some Cellone's Hard Rolls. I love those for sandwiches. I split them in half and toasted the cut side in the toaster oven. I had about a quarter of a bottle of Trader Joe's Enchilada Sauce leftover in the fridge. I poured that into a small skillet to heat it up. Then dipped the bottom, toasted side of the bun into it. Use whatever enchilada sauce you like. Spread a generous spoonful of hot refried beans over the sauced bun. Homemade refried beans, canned, whatever... that was Taco Bell canned refried beans plus taco sauce & lime juice. Add some moist delicious shredded pork. Now for the Chipotle Sour Cream. I was going to make it with canned Chipotles in Adobo sauce. But when I opened my last little can, it kind of exploded a little. So I thought I'd pass on the botulism and just mixed sour cream with Chipotle Tabasco. Put a nice dollop of chipotle sour cream over the pork. That's where I wish I had a selection of plastic squeeze bottles. That would be way more fun for applying sauce to sandwiches or whatever needs saucing! Anyway... added some shreddy lettuce. A generous spoonful of guacamole on the top bun. Cover it up and devour it! I totally had shredded cheese to put on this. I LOVE cheese. But while assembling them, I completely forgot about it. But ya know what? I think these were perfect without it!! The pics and directions aren't so great here. But the sandwich was AMAZING! Spoil yourself with a nice chocolaty treat! Why not try a new recipe? Your own favorite family recipe, favorite box mix, or your favorite brownies from the bakery!